A Marvel Masterpiece from deep inside the treasure vaults can now be told! 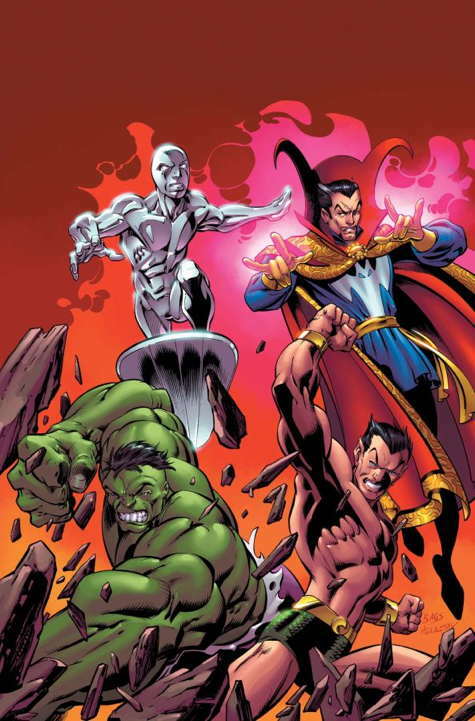 The original team of Doctor Strange, The Hulk, Silver Surfer and Namor are together again for a hidden adventure! But why was this tale lost? What happens in other dimensions stays in other dimensions, so what unspeakable secrets of the The Defenders are to be revealed? Find out at last in these pages with the illustrious words of Kurt Busiek (THE DEFENDERS, MARVELS) and the incomparable artwork of artist Mark Bagley (ULTIMATE SPIDER-MAN)! This may be one of the greatest Defenders stories ever told. Or it may be a total trainwreck. Or, just possibly, both. Or, you know, somewhere in between, there, but who sells comics with wishy-washy statements like “somewhere in between, there”? Back when Erik Larsen and I were doing Defenders, editor Tom Brevoort had a fill-in prepared, just in case. Mark Bagley had some time in his schedule, so Tom had Fabian Nicieza write up a plot—apparently very quickly, from what Fabian remembers—and then Mark drew it up, and it got put in a drawer. And then it was never used. As part of their whole “From the Marvel Vault” program, they’ve resurrected this story and finished it up. But there were a few problems along the way. First off, Fabian couldn’t script it, because he’s currently under contract at DC. So they asked me. I like writing the Defenders, I had a blast on that run with Erik, here’s a chance to revisit it, and it’s Mark Bagley art to boot, so why not? I agreed. Just send me the art and the plot. Well, they could send me the art. They don’t have a copy of the plot. No problem, I’ll just ask Fabian. No, he doesn’t have one either. Lost in a hard-drive crash, years ago. Mark doesn’t remember much more. It was years ago. So I look over the art, and Mark Bagley did indeed do a very nice job. And he’s a good enough storyteller that I can piece together an outline of what the story must be, at least in the basics. But the bits where explanations happen, where the texture and detail go that make it more than just a simple structure? So I have to come up with a story to fit the art. A new story. One that might bear some resemblance to what Fabian intended, at least at the big structural moments, but other than that, it’s wide open. I tell Fabian the idea, mostly as a joke. But he laughs, and says that it sounds like a hoot, and it might even be better than whatever his original story was. It’s not what Fabian plotted, not by any means. It’s very strange. It has a very old, very dumb joke about a hot dog vendor in it. It has the Hulk building sandcastles. A near-pointless cameo by Empress Lilandra. And I had a blast writing it. I think readers are going to have just as much fun with it. The Lady Dorma scene alone should be worth the price of admission. So be warned. And order up! This entry was posted in Uncategorized and tagged defenders by Kurt Busiek. Bookmark the permalink.